The reissue of the sixth Crime of Fashion Mystery is now available! My eBooks are now available at MANY more digital stores: Kobo, Barnes & Noble Nook, Apple, Inktera, etc. Links are on my BOOKSHOP page. Ellen Byerrum is a novelist, playwright, reporter, former Washington D.C. journalist, and a graduate of private investigator school in Virginia. 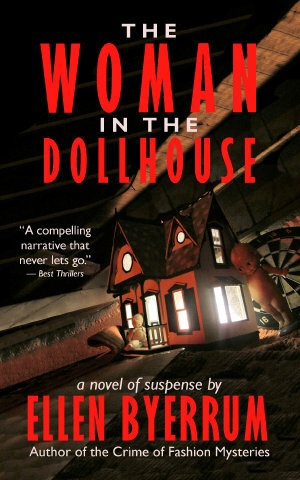 The Woman in the Dollhouse is her first suspense thriller. It introduces a young woman named Tennyson Claxton, whose mind seems to hold the memories of two very different women. 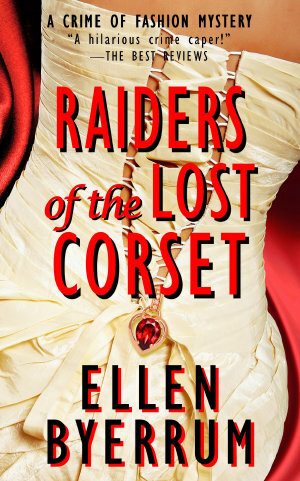 Ellen writes the Crime of Fashion Mysteries, starring that stylish female sleuth Lacey Smithsonian, a reluctant fashion reporter in Washington D.C., "The City Fashion Forgot." Two of these mysteries, Killer Hair and Hostile Makeover, were filmed for the Lifetime Movie Network. The latest in the series is Lethal Black Dress. 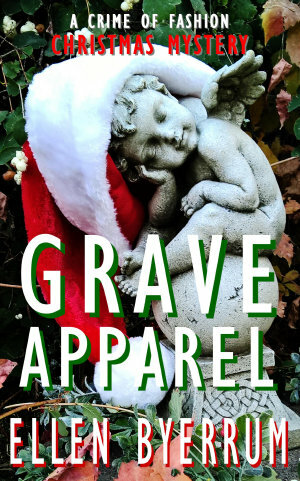 Her novels, her middle-grade mystery, The Children Didn’t See Anything, and her spooky Halloween ghost story, The Last Goodbye of Harris Turner, are all available on Amazon. Lacey Smithsonian looked down at the unfortunate woman in the coffin and thought, "Oh my God, that is the worst haircut I've ever seen." 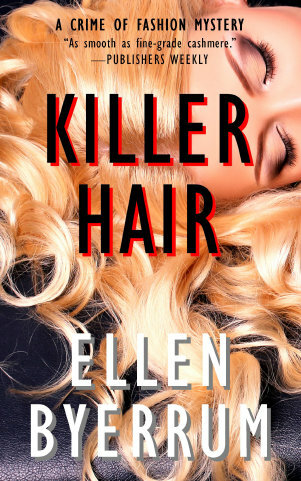 Killer Hair is the book that began the entire Crime of Fashion Mystery series, and launched my stylish sleuth Lacey Smithsonian on her comic (yet romantic) adventures in crime-solving, couture, and love. It's also the book that began my career as a mystery novelist, and I'm proud to present it in a brand-new edition that reflects my original vision for Lacey and her world. Designer Knockoff has always been, for me, the heart and soul of my series. This is the book where we first discover what Lacey's Aunt Mimi (and her trunk full of dusty old dress patterns) means to her, how they inspire her, and how that ancient steamer trunk leads her into a decades-old mystery -- and helps her find the solution. Mimi's legacy of heart, soul and style lives on in Lacey Smithsonian. 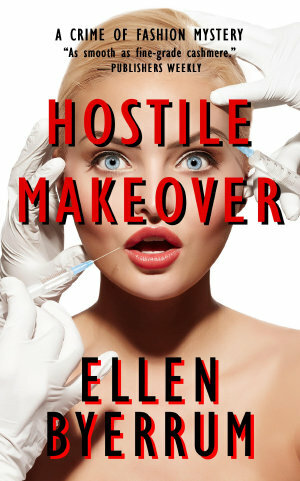 Hostile Makeover was inspired by the reality TV shows dealing in "extreme makeovers," from surgical to stylistic. I wondered what might happen when that outer “ugly duckling” becomes a beautiful swan. Might her soul suffer as radical a transformation? Would the dream of beauty and fame become a nightmare? How would an extreme makeover change the “lucky” girl and those around her in the celebrity world of high fashion modeling and design, as well as her loved ones? Why is Lacey ruining Christmas?! The holidays are a season of joy in Our Nation’s Capital, but fashion reporter Lacey Smithsonian learns there’s no room at the inn for the hungry and homeless. What’s in a name? Shakespeare said “a rose by any other name...” What’s in a book title? I’ve fought publishers for great titles that I’m glad I stuck with. And what about The Dollhouse in the Crawlspace? It might be my best book so far, and reviewers agree that my new thriller is intense, gripping and affecting, but was that title holding it back? It might have suggested a creepy horror story like Toys in the Attic, which it definitely is not. I'm very proud of my heroine Tennyson Claxton and her perilous odyssey to discover who she is and where she belongs in the world. She deserves another chance. And a new title! Here it is: The Woman in the Dollhouse. Please join me (and Tennyson) on this journey. Visit my YouTube channel! I post short videos every few weeks, full of useful, fun (and sometimes snarky) comments and advice about fashion, style, clothes, books, mysteries and writing -- and whatever my readers ask me about. Some of these bite-sized videos are based on my series protagonist Lacey Smithsonian's "Fashion Bites" columns. And some are not. Join me at the link above. Who in the world wants that beautiful red dress with the bad reputation? Everybody! Fashion reporter Lacey Smithsonian has never seen such a gown: crimson, flowing, fabulous. And infamous. The actress who first wore it on stage died in it on the closing night of The Masque of the Red Death -- and she was playing Death. Burglary, assault and murder now seem to haunt this legendary gown like a ghost. Who would want it enough to kill for it? Crazy theatre people? Costume collectors? Russian spies? 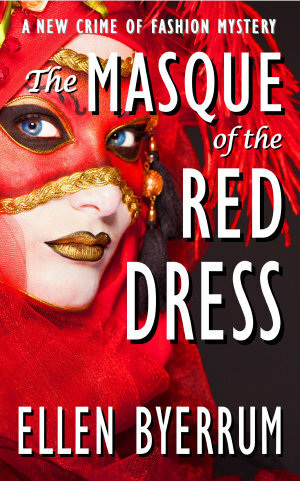 Spycraft and stagecraft, shadows and deceptions lead Lacey and the Red Dress into a macabre dance with an assassin -- and a masquerade with death. Lacey Smithsonian's journalism career is going nowhere fast. She's collared killers, rescued homeless kids and recovered priceless jewels, but she's still stuck on the fashion beat in Washington, D.C., The City Fashion Forgot. So what's a savvy reporter to do? Take a private eye class! Learn to sleuth like a pro (like her boyfriend, Vic Donovan), and maybe she can land a more serious news beat. 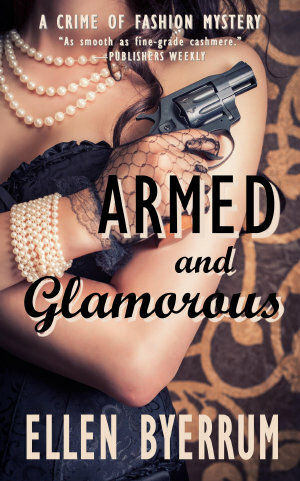 But then she meets her crazy classmates, stumbles over the haute-coutured corpse in the Jaguar, spends girls' night out at the gun range, and flunks Surveillance 101. All Lacey wanted was a shot at a new beat! So why are people shooting at her? And can she hit the bull's eye before the killer shoots again?